This print depicts the fearsome and trouble-seeking twelfth-century warrior Minamoto no Tametomo. 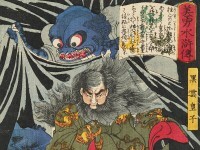 Tametomo became the subject of a best-selling serial novel called Chinsetsu yumihari-zuki (Strange Tales of the Bow Moon), by Takizawa Bakin, which was published in twenty-nine volumes between 1807 and 1811. 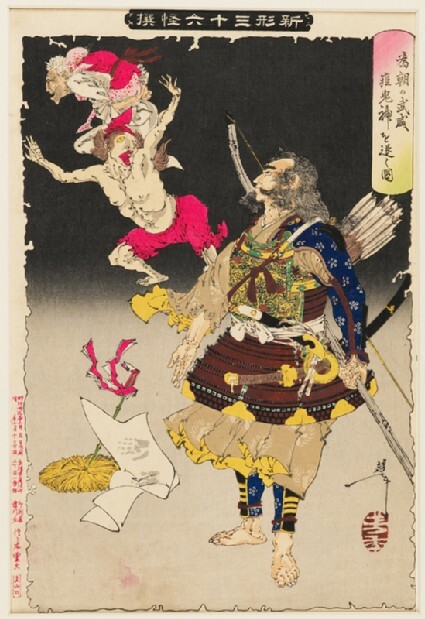 In this novel Tametomo becomes the ruler of Okinawa, and when smallpox demons threaten he persuades them through sheer force of character to leave.